My parents have always been keen gardeners and grow a variety of vegetables in the garden every yeae which results in us having a tasty selection of homegrown produce. 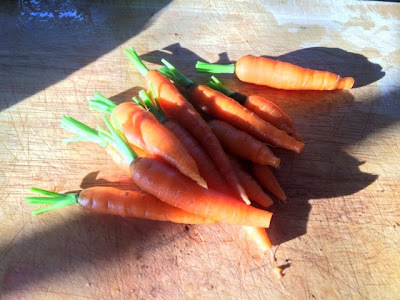 This year we’ve got loads of carrots that have only grown to miniature size. I mostly use carrots in things like stews, pies and bolognese as a basic starter vegetable so I was a little unsure as to what to use the baby ones for. 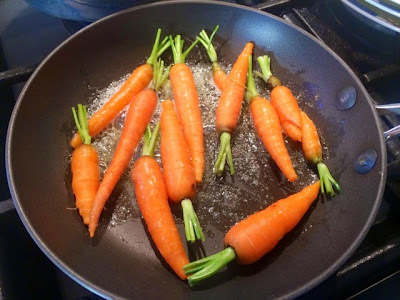 It seemed a shame to chop the carrots up and let them be disguised amongst a mixture of other stuff so I decided to keep it simple and serve them as a side dish on their own to fully appreciate the fresh produce. 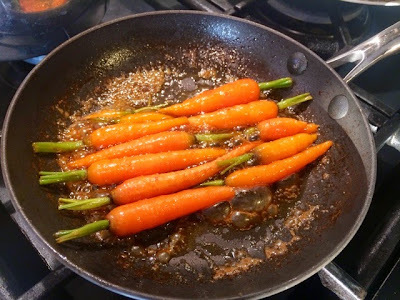 I’d heard about boiling carrots in orange juice rather than water before and so decided to take this idea and play with it a little and came up with this delicious sweet side dish. If you’re a fan of things like honeyed parsnips, this will be right up your street. 1. 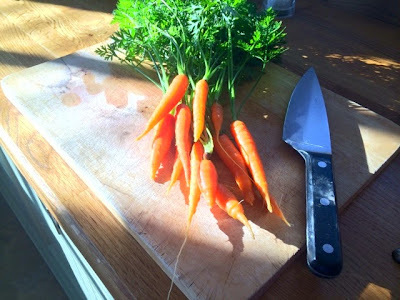 If your carrots are home grown like mine were or you’ve bought them with all the leafy stuff still attached, trim them to leave around an inch of stalk and chop of any straggly bits at the bottom. 2. 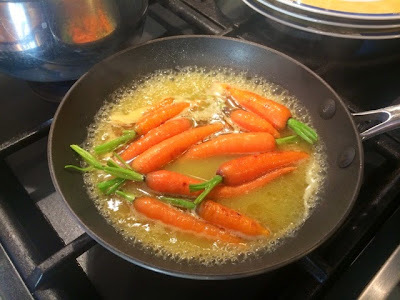 Melt the butter in a small frying pan on a medium to high heat and add the carrots. Pan fry until slightly softened. 3. Add the orange juice and bring to the boil then reduce the heat so the juice remains gently simmering. 4. Simmer, turning carrots occasionally until most of the juice has evaporated, the carrots are cooked and the orange juice and butter have left a tasty sticky caramel coating the carrots.